Middle ear infections may cause pain, hearing loss, and spontaneous rupture (tear) of the ear-drum resulting in a perforation. In this circumstance, there may be infected or bloody drainage from the ear. In medical terms, this is called otitis media with perforation. On rare occasions after a previously placed PE tube (pressure equalizing) falls out or is removed by the physician a small hole may remain in the eardrum. Before attempting any correction of the perforation, a hearing test should be performed. The benefits of closing a perforation include prevention of water entering the ear while showering, bathing, or swimming (which could cause an ear infection), improved hearing, and diminished tinnitus. It also may prevent the development of cholesteatoma (skin cyst in the middle ear), which can cause chronic infection and destruction of ear structures. If the perforation is very small, otolaryngologists may choose to observe the perforation over time to see if it will close spontaneously. They may also try to patch the eardrum in the office. Working with a microscope, your doctor may touch the edges of the eardrum with a chemical to stimulate growth and then place a thin paper patch on the eardrum. Usually with closure of the tympanic membrane improvement in hearing is noted. Several applications of a patch (up to three or four) may be required before the perforation closes completely. if your physician feels that a paper patch will not provide prompt or adequate closure of the hole in the eardrum, or attempts with paper patching do not promote healing, surgery is considered. There are a variety of surgical techniques, but all basically place tissue across the perforation allowing healing. The name of this procedure is called tympanoplasty. 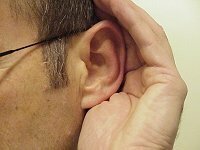 Surgery is typically quite successful in closing the perforation permanently, and improving hearing. It is usually done on an outpatient basis. Your doctor will advise you regarding the proper management of a perforated eardrum.